It’s been a while since I did one of these. Our longest hiatus yet, so it seemed right to usher in the (not so) New Year with an incendiary blast of noise – blow out the cobwebs and all that. There is nothing in my collection more suited to this purpose than The Stooges’ legendary second offering…to my mind the only time the band got it right, avoiding as it does the clinical production and patchiness of their first album and the bizarre muddiness of Raw Power, possibly one of the best terribly produced albums of all time (what was Bowie thinking of?)! In contrast, Funhouse is a nigh on perfect mission statement for a band that must have been an absolutely thrilling live experience when they were at the height of their powers…in 1970 (as opposed to 1969)! Apparently in 1970 they ‘felt alright’. Don’t you believe it. This is an album full of menace, nastiness and danger. This is no artifice – this is even more 4 real than the Manics carving their arms in the NME! I remember one sultry Summer evening (we had them back then), not long after purchasing Funhouse, lying in my bedroom at my parents’ house in a sleepy Somerset village whilst the Stooges blasted me to sleep. The following morning my brother commented that he could hear the record from the other end of the village. Never has an album been further away from home! Funhouse belongs in the city, in a dirty and mean metropolis, preferably whilst there is a riot (or at least some looting) going on. Funhouse is very much an album of two halves. Side A is definitely more accessible with Down in the Street’s gritty groove leading into the thrilling Loose which still sends a shiver down my spine every time I hear it, despite being played far too often on the various compilation tapes I have worn out over the years. TV Eye pounds away, bludgeoning the listener into absolute, sweet submission and then Dirt slowly grinds for seven minutes sounding as fresh and vital now as the day it was made. I absolutely love this side of vinyl – probably my favourite twentyish minutes of ‘loud’ rock and roll. You’d think that there would be no way to out do these four songs but, if anything, side B is even more intense! It only occurred to me recently that it’s the introduction of a saxophone on the three songs on the second side of Funhouse that changes the mood of the record. The songs here are darker, more brutal, harder to take. In fact, the final 4 minutes of LA Blues is pretty much a free-form rock jazz mess, a seemingly random mix of howls, sax, drums and guitars that echoes some of the more challenging offerings from John Coltrane and Miles Davis during their excursions into noise in the mid to late 60s. Yet it’s worth hearing out and I’m glad I don’t have the option to skip LA Blues as it forms an integral part of one of the most exciting and visceral offerings that has yet to enter the rock and roll pantheon. Rob listened: I’m disconnected from The Stooges’ discography. I taped what I thought was their first album from the University of Leeds library in 1990 or so and loved it. On reflection it seems to have been an amalgam of their first two, or maybe three. It definitely had both ‘1969’ and ‘1970’ on it, plus both ‘TV Eye’ and ‘No Fun’. If i’m honest, I think I prefer the slightly younger, more wiry, jittery first songs to those from ‘Fun House’, but that’s not to deny what a powerful force Iggy and his fellow hoodlums were, to which this stands as ample testimony. Nick listened: I’m pretty sure I bought this at university, almost certainly from Spinadisc in Northampton, where I spent many hours escaping from emotional turmoil by browsing the racks. Even if I didn’t, I’ve had it for years and years, but probably only listened to it half a dozen times at most; so little that I’ve never consciously noticed the saxophone divide that Tom mentions above. 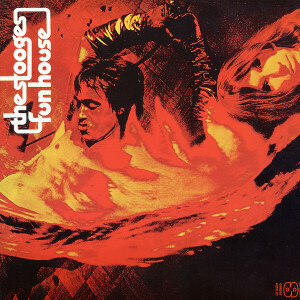 Every time I have listened, I’ve enjoyed it – especially the relentless grind of Dirt – but Funhouse, and The Stooges in general, fall into an odd category that I might be tempted to call “historiography rock”; really good, clearly exciting, ahead-of-its-time stuff that just doesn’t quite click emotionally for me. Plenty of stuff falls into this category – Bobs Marley and Dylan, John Coltrane, Neu!, Funkadelic, The Small Faces, The Who, The Doors, The Velvet Underground, Wire – and listening to it feels a little like research, checking off a list of important music, whilst other stuff seemingly from before my time – CAN, Miles Davis, Marvin Gaye, Curtis Mayfield, Talking Heads, Love, and most notably The Beatles – I feel properly invested in. I guess that’s what we call ‘personal taste’. Graham listened: I have to admit that I’ve never been drawn in by Mr. Pop and his colleagues. I’ve heard plenty over the years but never sat down and listened to a whole album of work. There has always been something for me about Mr. Pop’s cultural icon status that has strangely put me off giving his music the attention it maybe deserved. I really enjoyed the first half of this album but felt that was all I needed to hear. Credit to them for pushing the boundaries and influencing generations to come, but I’m still feeling I will be listening to those they have influenced, rather than returning to the source.